For a React component created using the ES6 class syntax, you can set default props by adding a static property named defaultProps to the component class. 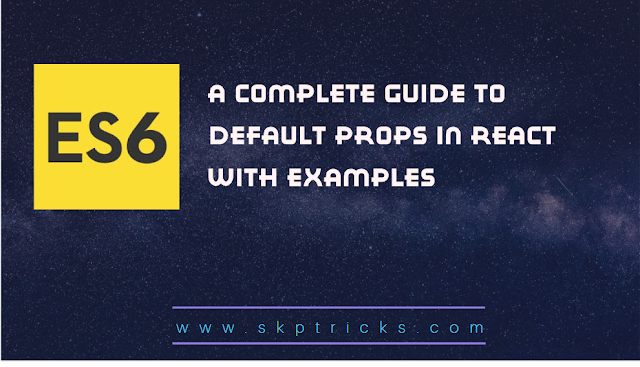 The defaultProps static property should be set to an object representing the default props for the component. you can define defaultProps on the component class itself, outside of the class body. when you are using static keyword with defaultProps, then you should define static default props inside the class. In this example, we are defining the defaultProps on component class using ES6 class. Lets see the below example. In this example, we are defining defaultProps with static keyword with ES6 class. Similarly, we can use defaultProps in functional components as well. Lets see the below example, which provides you complete understanding how to use defaultProps in functional components. This is all about default props example in react application.Thank you for reading this article, and if you have any problem, have a another better useful solution about this article, please write message in the comment section.